By releasing this recipe I’d like to invite you to my hamburger party! This is my quick, easy, and fast recipe for hamburgers. I’m not an expert in hamburgers but whenever I make hamburger this way, everybody loves them. Sharing recipes is a great way to connect with people, especially those who are interested in making and eating delicious homemade food. It’s going to be a very simple and delicious meal for you and your family and friends one weekend. I used to make hamburgers when I was in Korea, too, but they were very different from this. I made them Korean style, almost like bulgogi, and mixed in soy sauce, garlic, and sugar into the meat. That’s what most Korean hamburgers are like, and my family loved them. When I came to the US, I found that American hamburgers are very different from Korean hamburgers. They ‘re much simpler and without so many seasonings and since I left Korea I’ve been making my burgers in the classic American style. These days I have a lot of Korean followers on YouTube, so I’d like to show them the American style, too. Maybe someday I’ll make a video for the Korean style I used to make. No salt is the most important tip here. I don’t put any salt on my hamburgers but the mayonnaise, yellow mustard, and a slice of cheddar cheese give the burger the perfect amount of saltiness for me. And I choose 85% lean ground beef so that the burgers are perfectly juicy when cooked, and not too dry and not too fatty. They sizzle nicely on the grill and come out perfect and shiny! Enjoy your summer with your homemade hamburger! Divide the beef into 3 equal portions. Grab one portion and press and knead it between your palms to make a ball. Place it on a cutting board lined with parchment paper. I use the butcher paper that wrapped the ground beef. Press it down with your palm and smooth out the edges to make a 4½ inch diameter disc that is slightly wider than the buns. Gently press the center of the patty so it’s a little thinner than the edges so that after the hamburger expands as it’s cooked, the patty will be even. Repeat with the other 2 portions and make 3 patties. Set aside. Heat a heavy grill pan for about 2 to 3 minutes until it’s very hot. If you use a regular pan, it will take only 30 seconds to 1 minute. 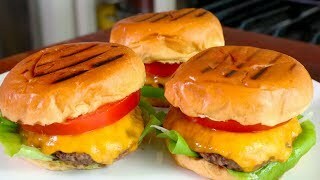 Rub about 1 tablespoon of butter on the grill, then put the buns on it and cook them for about 30 seconds until slightly crunchy and light brown. Turn them over and cook another 30 seconds until both sides are a little crunchy. Put the buns on the cutting board, tops and bottoms side by side. Add 2 tablespoons butter to the grill and spread it evenly. Place the patties on the grill cook for 2 to 3 minutes until light brown on the bottom. Turn them over with a spatula and cook 1 minute. Add the cheese on top of each patty. Cover and cook another minute until the cheese is nicely melted and covers the patties. Remove from the heat. Spread about 1 tablespoon mayonnaise on the bottom half of each bun and about 1 teaspoon yellow mustard on the top half of each bun. Sprinkle some ground black pepper on the top bun. Put lettuce and onion on the bottom bun over the mayonnaise and put a tomato slice on the top bun over the mustard. Add the cooked patty on top of the lettuce on the bottom bun. Place the hamburger on a large plate. Serve with cucumber pickle. Posted on Saturday, July 28th, 2018 at 12:02 pm. Posted September 6th, 2018 at 2:03 pm | Log in to reply. I used to eat a burger when I was in Korea that I absolutely loved. It wasn’t your average burger made with beef though; I believe it was a soy burger advertised as hamburger though. Never been able to find anything even close to it here in the US and wished I had asked for the recipe before I left to come back to the US. Posted August 4th, 2018 at 7:25 pm | Log in to reply. I love a basic burger, lettuce & tomato. I like to put mayonnaise (the real mayo not the salad dressing kind) on my hamburger and have it with a dill pickle. But I have also put kimchi on hamburgers as well. It’s really delicious! I even had a kimchi burger at the Hard Rock Cafe in Boston! But I must say, I think my home made kimchi burger with home made kimchi was better! As always, thank you for sharing your knowledge with us! Posted August 13th, 2018 at 8:23 am | Log in to reply. Of course you will add some kimchi and you will experiment with some Korean flavors! : ) But as I mentioned, hamburgers are a new food for me, so I’m learning some Western food and you’re learning some Korean food! Someday I will share my Korean fusion hamburger here. Posted August 4th, 2018 at 4:13 pm | Log in to reply. Hamburger history: First made in Hamburger, Germany, about 1890. I think the meat grinder was invented there, as well. Meat grinders were invented in the late 19th Century. Prior to that, all sausage meat was hand minced. Hamberger was invented as a breakfast sausage. Frankfurters were invented from finely ground hamberger as an inexpensive breakfast sausage even the poor could enjoy. I like Mexican-style hamberguese, made qwith chili peppers and other things, as well as tomato and lettuce, onion, and so on. What you put on your burger is personal joy. Peace to you, and love that patty! Shon tsi, niio! (walk in beauty). Thank you for your good info, which is very useful! This recipe was originally posted on July 28, 2018 at 12:02 pm by Maangchi. The video was watched 318,801 times on YouTube & has 13,092 likes!